Lower abdominal pain is one of the most common stomach issues. It can be related to the digestive tract, urinary tract or reproductive organs. It is crucial to get rid of lower abdominal pains because they can get severe fast. Severe lower abdominal pain is mostly cause by inflammations as a result of appendicitis, bowel obstruction and perforation. A lot of times Lower abdominal pain is caused by infections and inflammations that can be treated with a dose of antibiotics. STDs and mostly herpes are also major causes of lower stomach pain and can be treated with antibiotics. Common issues that cause pain such as indigestion, gas and bloating can be solved by drinking a lot of water. Water will help with digestion, clean out toxins and clean up the stomach. Urinary tract infections can also be sorted with a lot of water as it flushes all the bacteria out of the tract and dilutes your urine. Unfortunately, some lower abdominal issues are more serious and should be operated on. Women having miscarriages must be cleaned in the operating room to create a healthy environment for future pregnancies. Other issues such as fibroids, ovarian cysts, kidney stones, endometriosis and ectopic pregnancy require surgery to treat and get rid of the pain. Hernias in men and testicular torsion must be operated on for proper correction as this is the best way to get rid of the pain. 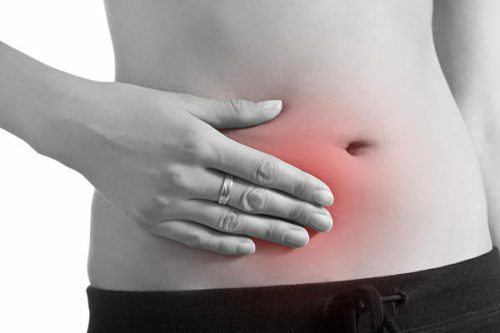 More often than not, lower abdominal pain is caused by either digestion problems or menstrual cramps in women. A fiber-rich diet will help with digestion issues, alleviating bloating, gas and constipation. One should eat a lot of cabbage, cauliflower, broccoli and pumpkin. Some fruits like pawpaw also help to clear up the stomach and get rid of that pain. Potassium-rich foods such as bananas, white beans, leafy greens and fish are good for reducing cramps. Fatty foods and too much starch should be kept at bay for a while. Focus on eating proteins and vitamins mostly. Any good supplements such as vitamins, magnesium and omega 3 are always good with menstrual cramps and so is chamomile tea. Though you may not be able to hit the gym when you are in pain, some form of exercise and stretching will help get rid or reduce abdominal pain. This is of course if it’s not something serious like appendicitis or hernia. Try to walk, do yoga, swim and just lay flat on your back and stretch your body to enhance circulation in the stomach. Exercises will not only make your pain go away but will also take the focus away from the pain in the meantime. Birth control pills-birth control pills are used to reduce pain and bloating during periods and also to in women who have fibroids and ovarian cysts. Some forms of abdominal pain can be alleviated at home but if the pain persists one should see a doctor. Left lower abdominal pain is especially serious and if accompanied by other symptoms like fever and bleeding, it is probably an emergency. A doctor will take a urine and stool samples as well as vaginal swabs to diagnose the problem. A CT Scan or X-ray might be necessary too so that the right condition is treated. When experiencing abdominal pain, one should avoid caffeinated drinks like coffee and coke because they can make cramps worse and increase gas. Do not treat yourself unless you are a hundred percent sure what the problem is.